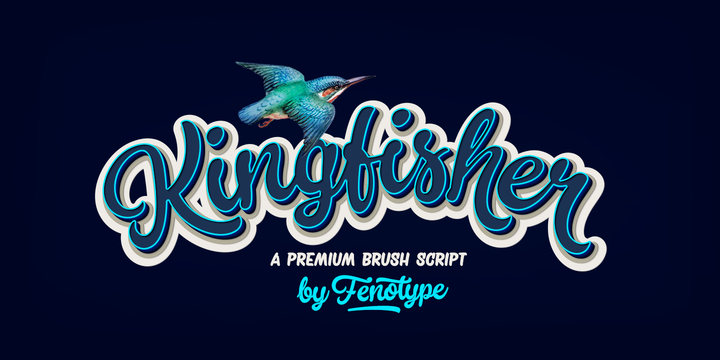 Kingfisher is a hand drawn typeface created by Emil Karl Bertell and published by Fenotype which is available in 8 styles, (three Script, three Caps and two Extras) and usefull Open Type features such as Ligature, Titling Alternate, Swash, Contextual Alternate & Ornament. This brush script is ideal for display, logo, invitation, sign painting etc. Have fun! Price: starting from $20,00 for one font to $50,00 for all 8 fonts. A font description published on Monday, February 12th, 2018 in Emil Karl Bertell, Fenotype, Fonts by Alexandra that has 1,795 views.